When I think of an artistic director, a budding comedian isn't exactly what comes to my mind. 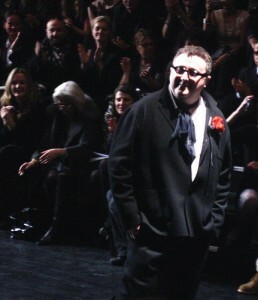 However, Lanvin designer Alber Elbaz apparently had a store opening crowd "in stitches" as he entertained with his quick wit and humor. Among the amused crowd were some of the designer's fellow fashion lovers such as models Anouck Lepere and Yasmin LeBon and fashion photographer Juergen Teller. Though he might have a knack for stand-up comedy, thankfully Elbaz will continue his divine work with Lanvin as the company continues to expand.